Trash Knight | Taking trash night out of the dark ages! How durable is the Trash Knight™? Q. How durable is the Trash Knight™? A. Very. They are made of MIG welded .090 wall mild steel with .120 wall hinges and hinge bushings, 250lb. 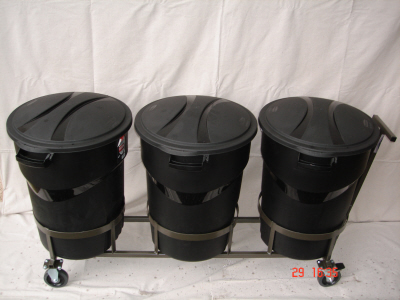 capacity greaseable ball-bearing casters with plated, galvanized or stainless steel hardware. 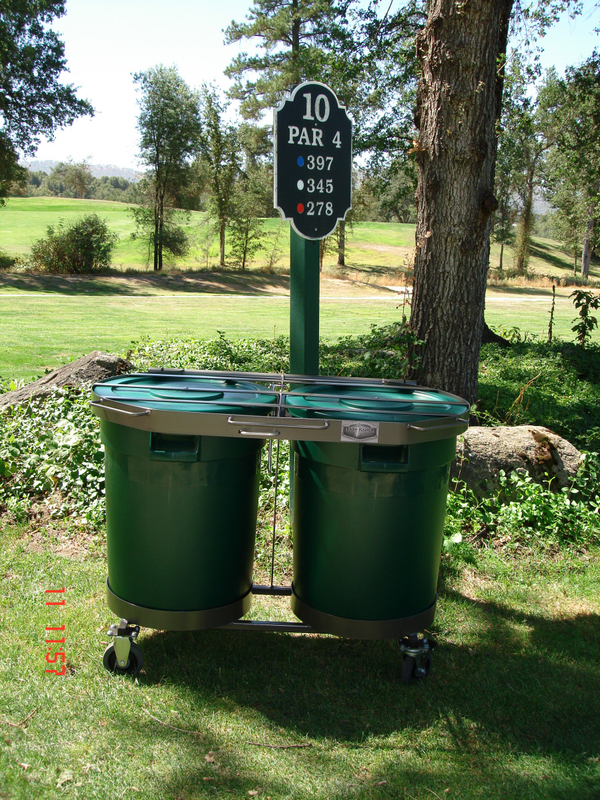 Each rolling unit has a capacity of over 800 lbs. 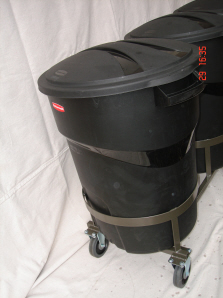 Designed for commercial or residential use, the hinged lids will withstand many thousands of cycles. Latches are easy-use spring loaded stainless steel. Many of the three year old units in my area(mountainous, snowy, rainy) still look like the day I delivered them, as long as they haven’t been rolled too many times by the bears, which sometimes scratches them. 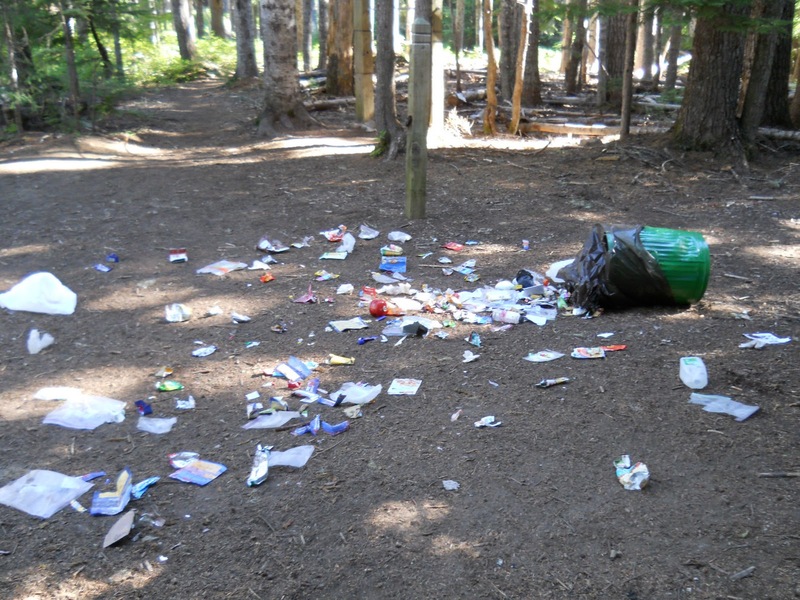 We do not bill our units as ‘bear-proof’, but they have managed to be for over three years (as of 6-30-12) through hundreds of attempted entries. In a three week period in May/June 2012 alone, my personal three can Premium unit was hit over twenty times without effect. There have been three exceptions to the above: two cans have had the sides bitten through by enormous bears, and one unit was forced open. We design the stainless steel latch rod on the Premium model (a ten dollar part) to fail so that the units are not destroyed if forced, and the bent rod was repaired in seconds with a wrench. There was no other damage. The secret to the bear-resistance of our product is its light weight and the fact that the cans spin in the units when pawed at. They are barrel-rolled, bitten and stomped on with great regularity, and although they are designed to fail in a specific place, only one out of hundreds has, as leverage against the unit is so difficult to attain. 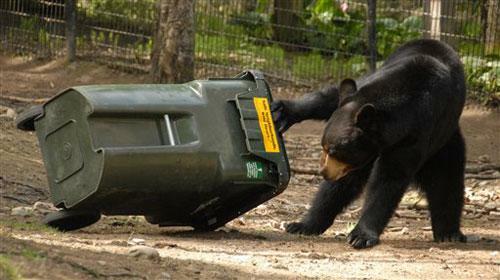 Many customers claim that bears in more heavily populated areas learn quickly to go to the neighbors unprotected trash cans. The three incidents discussed above happened in more remote areas. Our Premium and Standard units are canine, feline, raccoon, opossum, feral hog, rodent and bird proof. Check out the reasons Trash Knight rocks! Q. What are the differences between Premium, Standard and Unprotected units? A. Our Premium units have a handy and fast spring-loaded stainless steel latch, operated by the hand that opens the unit. Our Standard units use a simple pin that must be pulled before opening- they are slightly less convenient and slower to use (by about 2 seconds), but just as strong and more cost effective. Our Unprotected units do not have hinged steel lids at all, and provide protection only from the knocking over of cans by dogs. They work great for entertaining also. 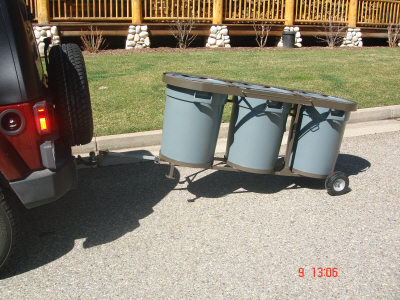 All of the above are available in Fixed, Rolling, or Towable configurations. Q. What trash can does the Trash Knight™ use? A. 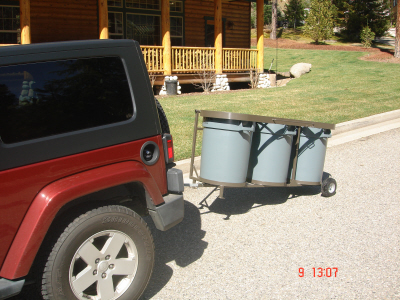 Our products are designed for the Rubbermaid BRUTE™ 32 gallon trash can. 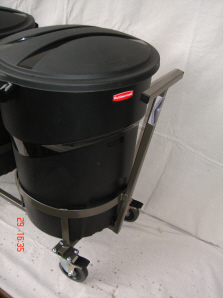 Offered at about $30.00 at big box stores, we know of many that have been in use for over 15 years. The standard of the hard-use landscaping industry, they are nearly indestructible. Q. What color will my Trash Knight™ be? A. Powdercoated bronze. This is a very durable electrostatically applied, oven baked finish. 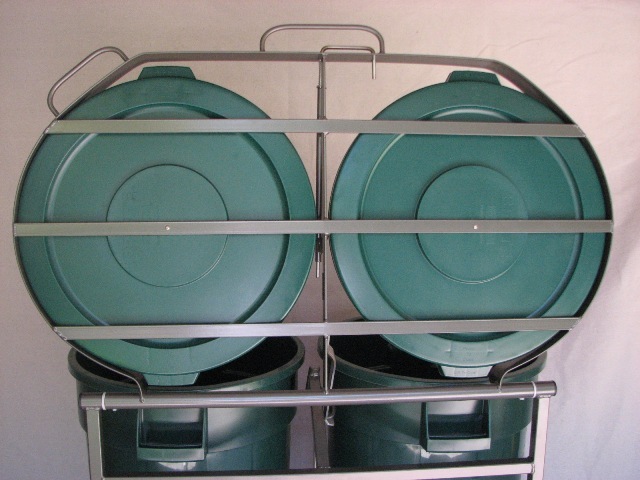 With green cans, the units are colored like a tree and blend in well with homes, yards, most businesses, etc.. With grey cans, they look handsome, but more industrial. Grey and green are the can colors you will find at Home Depot™, but other colors can be ordered in black, white, yellow, blue and red. 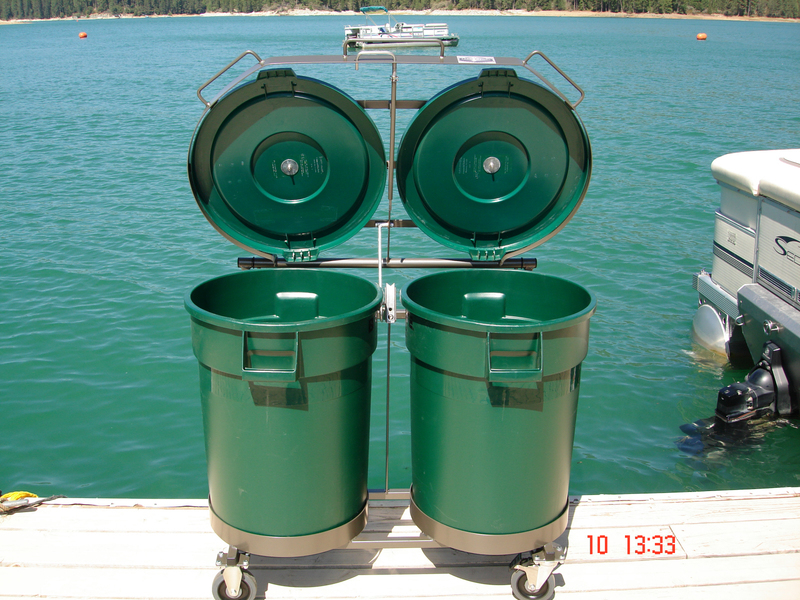 Our products can also be galvanized at additional expense for use at beaches, ocean-side docks and other more extreme locations. Powdercoating has a life expectancy of 5 plus years (with 10 not uncommon) and galvanizing is usually quoted as 25-75 years, depending upon environment.